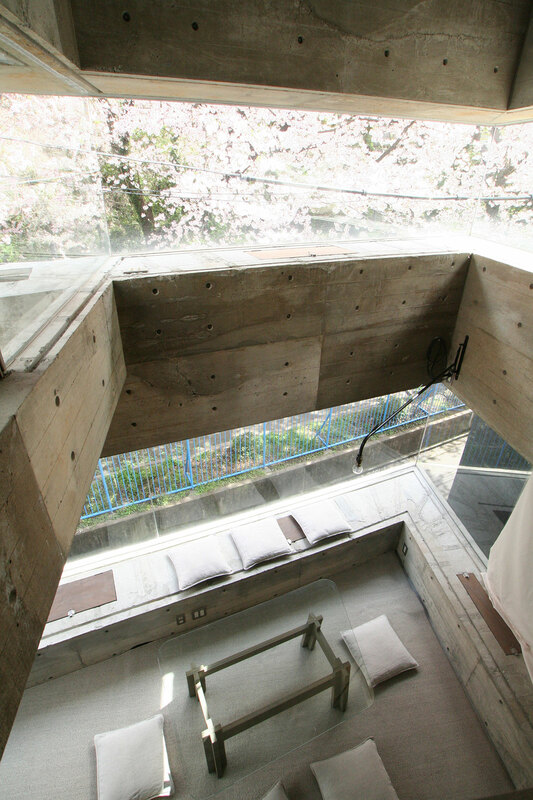 Occupying a plot of just 45 square meters across from a picturesque park in Yokohama, Japan, Oriel Window House by local practice Shinsuke Fujii Architects is a glass and concrete building that takes full advantage of its location and limited footprint to provide its occupants with comfortable living and working quarters of minimalist elegance. 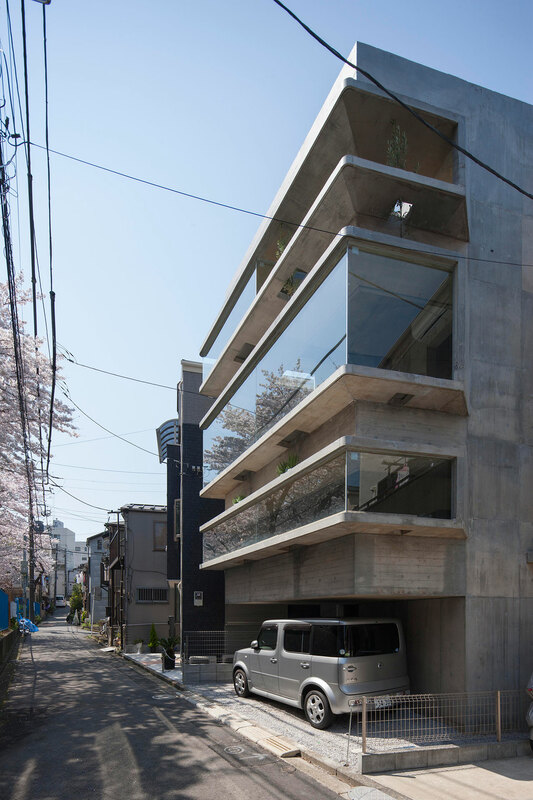 Unfolding across four floors with a total area of 75 square meters, the building is divided into living quarters on the two upper levels and a separate office space occupying the two lower levels. 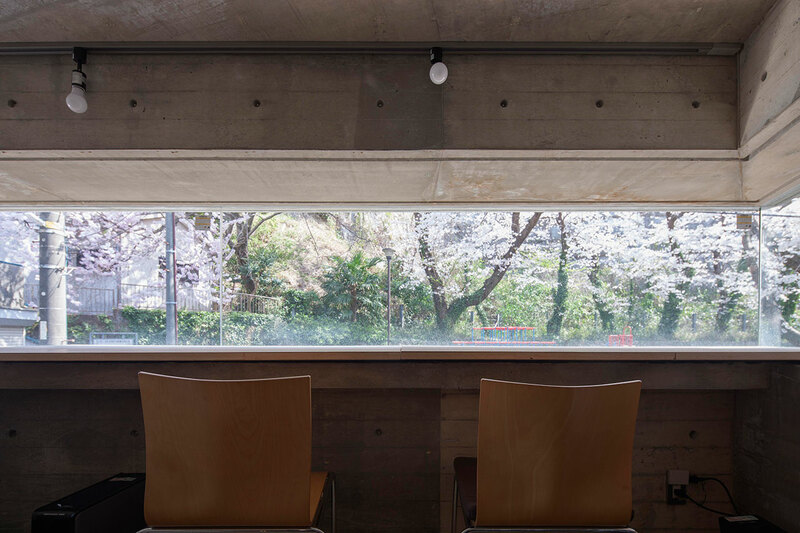 Both sections centre around a double-height space – which the auxiliary rooms are connected to - in what conspires to be a clever layout whereby all spaces are visually connected creating a sense of spaciousness despite the limited floor area. 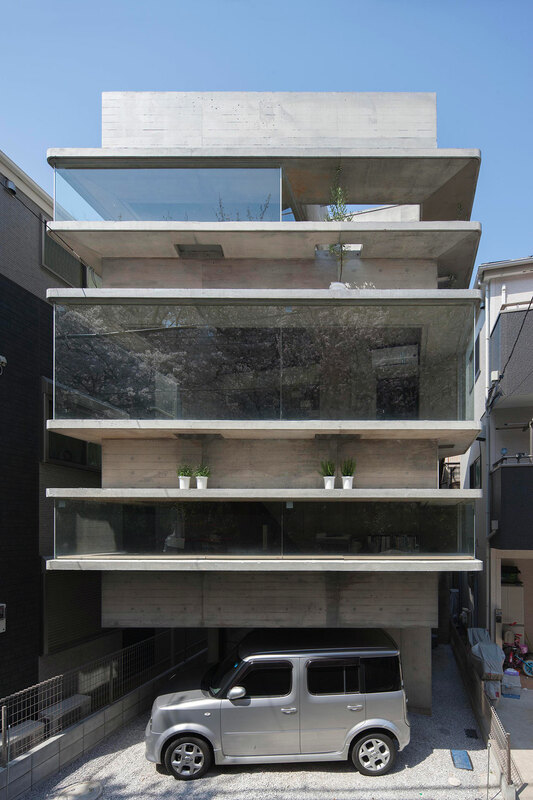 Running across the entire length of the street façade, which floats above the ground-floor parking due to a cantilevered structural design, three horizontal bands of glazing decompress the concrete structure establishing the building’s unique character of buoyant brutalism. Designed in the form of frameless, box-shaped oriel windows—a type of bay window that juts out of the façade which the house takes its name from—they maximize daylight penetration and increase solar heating during the winter months while also acting as solar shading come summertime while also providing grand, unobstructed, cinemascopic views of the cherry trees across the street. The bay windows also contribute to the ergonomic design of the interior spaces since they are cleverly used as a desk in the office area and as a bench in the living room. Moreover, small hatch openings allow for natural ventilation and as well access to the potted plants that decorate the façade. 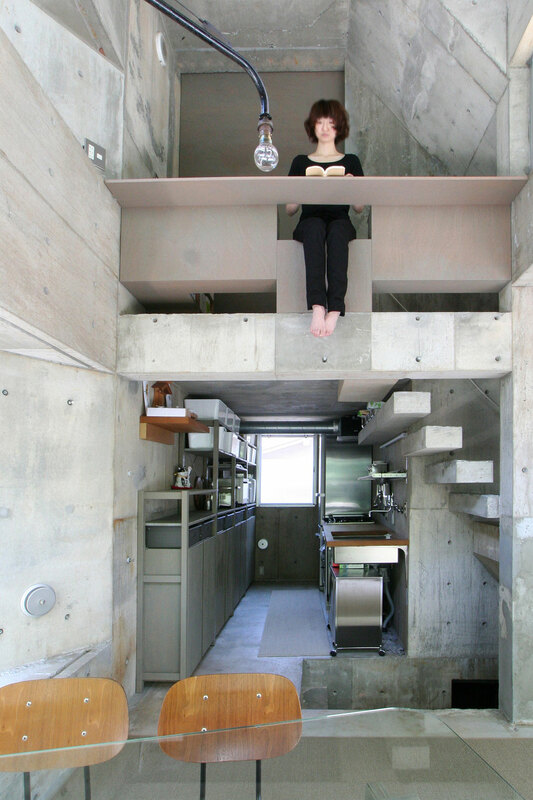 Aesthetically the brutalist sensibility of the building's exterior is carried on into the interiors with exposed concrete being predominant throughout. 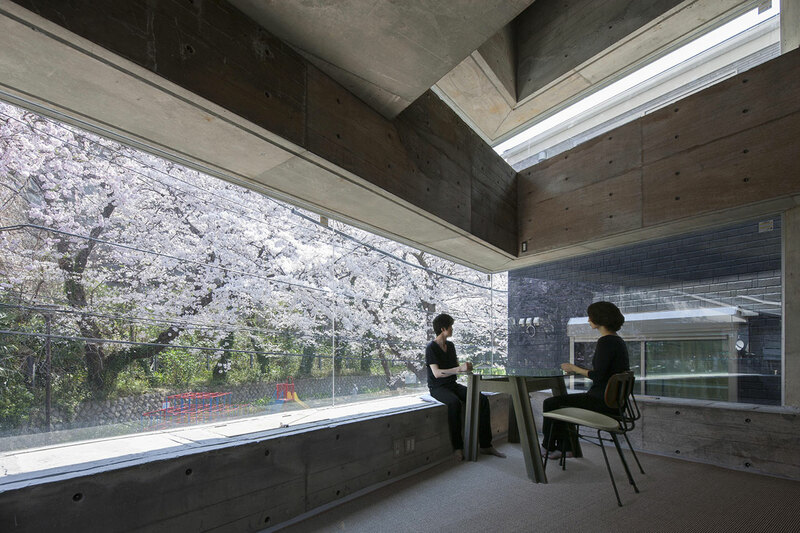 Viewed against the ethereal whiteness of the cherry blossoms in the springtime or the green exuberance of their summer foliage, the juxtaposition with the solemnity and heftiness of the concrete structure is both monumental and precious, much like the design of this singular house.